Homemade French Onion Soup is one of my favorite recipes of all time. I don’t know why a soup that is so simple in the ingredients tastes wonderfully complex and rich. You can make this soup, it may take a little extra time, but once you make this, you will never buy this in a can any longer. Growing up for special occasions my family would go out to a nice steakhouse for a fancy dinner. Being a child of the 1980s this meant you could order French Onion Soup in a fancy restaurant. This was a soup my mother never made. So for me, it was a treat only available at a restaurant. When I grew up as a young adult a dinner at a steak restaurant meant I would order a bowl of this soup. This soup has a few key ingredients. You will need real butter, this will help the onions caramelize very well. I like to use white onions for this recipe. Yellow onions will work well, but I tend to like the flavor of the white onions best. We will also use cloves, a couple of bay leaves, dry Sherry, flour, beef stock, and Gruyere or Provolone cheese as well as a baguette if you desire. I suggest using dry Sherry because it is going to pick up the browned bits of the onion that will appear in your pan. This is where the flavor comes from. I like to use a dry Sherry because it is a fortified wine. A fortified wine is great to have around because you can use it when you need a little something extra in a dish. Regular wine isn’t fortified so it will oxidize and go bad, where a fortified wine won’t oxidize so you can use it anytime. So this soup isn’t hard to make at all, so I encourage you to give this recipe a try. You don't need to go to a fancy restaurant to make French Onion soup, it's easy to make this classic French recipe yourself. Melt the butter in a large heavy bottomed pan over medium heat. When the butter has melted add onions and salt. Cook the onions stirring occasionally until they have browned. This will take about 30 minutes. About halfway through the onions browning add the garlic and bay leaves. Add the dry Sherry and scrape up the browned bits on the bottom of the pan. When the Sherry has evaporated add the flour, and stir well. Cook the flour into the onions until you can detect a faint smell of pie dough. This will take about five minutes. The flour must cook thoroughly. Add the beef stock and turn down the heat to a simmer. When the soup has heated through you may serve the soup. A serving suggestion is to toast a baguette slice on both sides and add it to a heat proof bowl that has been filled with the soup. Layer the bread upon the soup, and add a couple of tablespoons of cheese to the bowl. Place the bowl under a broiler until the cheese just begins to brown. What do you suggest as a substitute for meat soup stock? Some people seem to use yeast. I once saw a recipe that used beer. I would most likely do a vegetable stock. 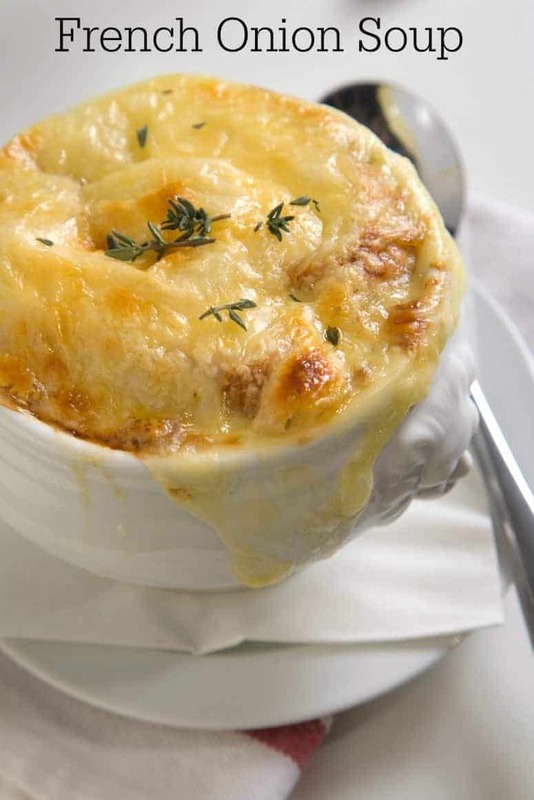 French Onion Soup is o delicious and those pictures make me want a big ol’ bowl right now! This recipe is on my to do list for Sunday! Thanks so much Amy! I hope you enjoy the recipe. I can’t do sherry (allergic) is there a substitute? You could do a dry white wine. You could make it with chicken stock. Nothing beats a good French Onion Soup. This one looks incredible!